Darius’ Umbilical Chords is a guitar reference chart to hang on your wall. It will greatly assist you practice understand and memorise essential music theory. The chart shows all the chords and scales from the more commonly used major, minor and pentatonic scales right through to the more altered and unique sounding scales such as melodic, harmonic, jazz minor, augmented & diminished scales. The chart shows the seven modes from each of the major scale, harmonic minor scale and jazz minor scales and which chords work with which scale. It is highly valued by students and teachers alike to improve guitar playing by augmenting a musical vocabulary and knowledge of essential music theory. You will see through colour coded diagrams, the relationship between the chord and relevant scale. See and understand how a “diminished half whole” scale functions over an altered dominant 7#9 chord, or how a “super-locrian” scale functions over an altered dominant 7#9#5 chord. Hear how a major or minor pentatonic scale can be embellished with a minor 3rd or flat fifth respectively to create a “blues scale” The chart also illustrates the harmonized scale tone chords and extensions from the major scale, harmonic minor scale and jazz minor scales. Undoubtedly the most comprehensive guitar reference chart available Darius’ Umbilical Chords is an incredible asset for any guitarist at around the cost of a single lesson. The chart will also complement other teaching methods including tutors, books, DVDs, videos and online learning methods or can be used as a stand alone resource. Darius' Umbilical Chords enables a student or teacher to locate and play/demonstrate a particular chord or scale without the need to turn pages, flick through screens or pause media sources. This has the added benefit of encouraging a guitarist to keep their hands on their instrument without unnecessary distraction. The chart has been purchased by teachers and students from around the world and from all musical backgrounds, from jazz & blues to progressive rock & heavy metal. It has also been purchased by many leading educational institutions including the Conservatorium of Music and the Australian Institute of Music. Most guitarists use a combination of licks, fretboard knowledge and understanding to be able to freely express themselves and create their own melodies and solos. Darius’ Umbilical Chords will undoubtedly assist in those areas together with song composition skills acquired through a better understanding of this theory. Purchase a chart as a present for yourself or any other guitarist and start improving your guitar playing immediately. 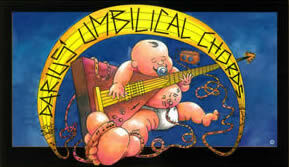 Darius Umbilical Chords is sold at all good musician’s shops in Australia or available here online. a great tool for learning, practicing & teaching - an asset for all aspiring musicians.